Almost 10 years on from its introduction, Borehamwood’s finest resurrects the original lunchbox bass head for 2018. 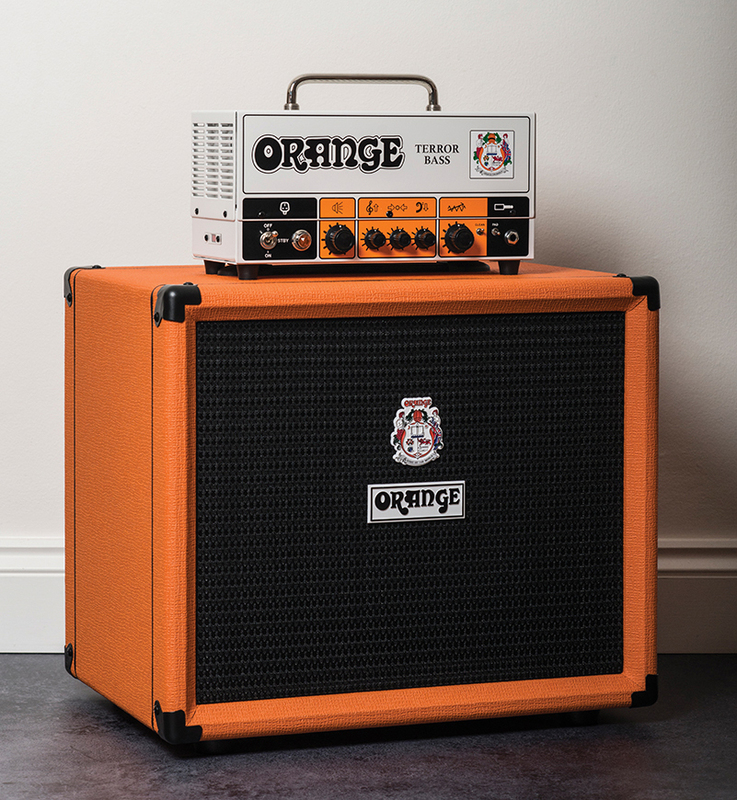 Orange’s Tiny Terror popularised the lunchbox guitar amp craze over a decade ago and was followed by bass version, although both models have been discontinued for couple of years. Until now, that is, because the Terror Bass is back. Arriving in its familiar nylon gigbag complete with a side-pocket for a couple of cables and a shoulder strap for an easy load-in, the Terror Bass is a hybrid, single-channel circuit housed in the now classic white powder-coated chassis adorned with the Borehamwood company’s pics-only control panel, vintage- style logo and the coat of arms of House Orange. 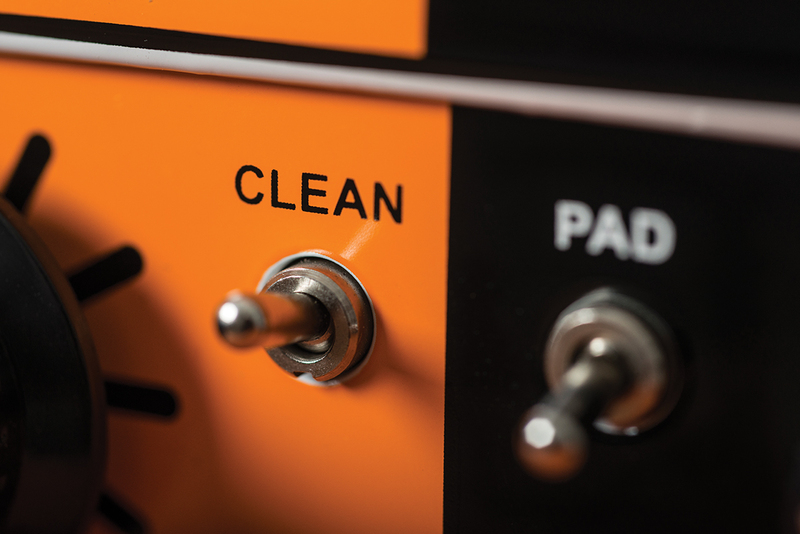 Although the layout is similar to the original, the mini-toggle labelled ‘clean’ on the front panel is designed to deliver more headroom and smoother tones. 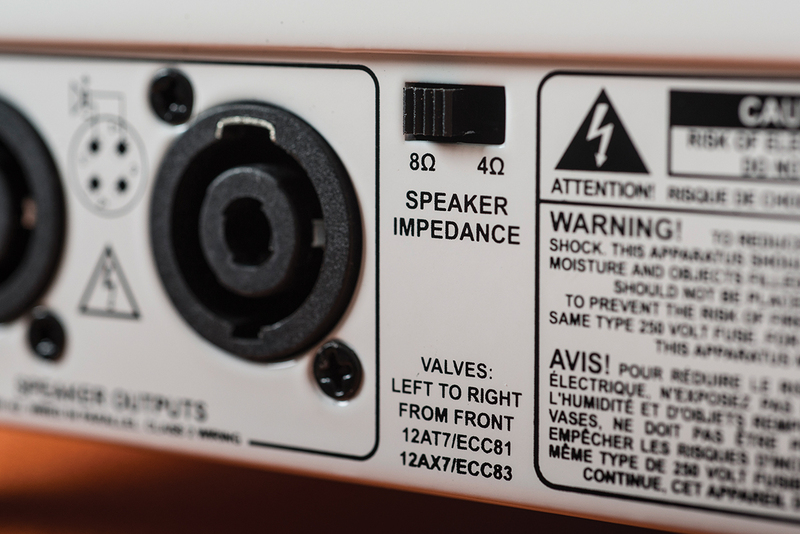 The redesigned hybrid amplifier features a 12AX7 front-end based on the company’s AD200 head, while a pair of Speakon connectors around the back and a 4/8-ohm impedance switch allow the diminutive unit to kick out 250 or 500 Class D watts. 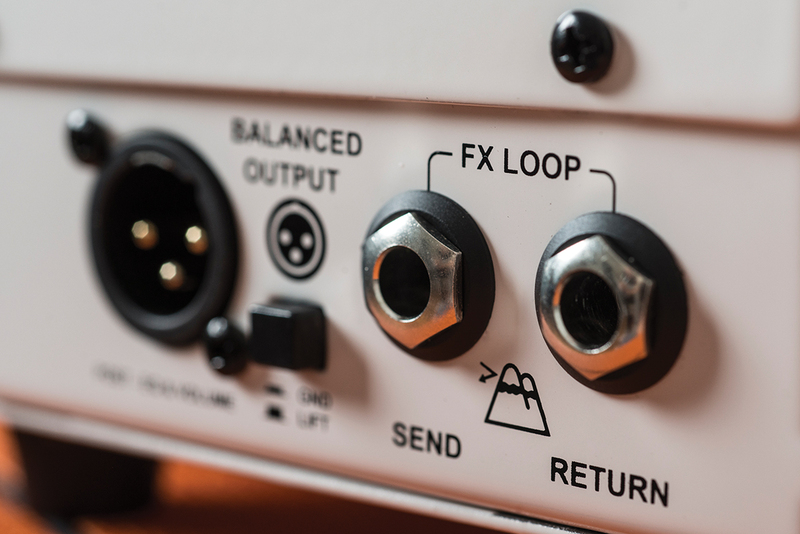 On the right-hand side, you’ll find a balanced XLR direct out and an effects loop with a valve-driven send and solid-state return. A cooling fan is visible through the grille but powering up reveals that it isn’t intrusively loud. At the risk of causing controversy… getting a good bass sound isn’t exactly rocket surgery. Some of the greatest studio bass recordings of all time have been achieved with a DI box and a compressor and live, it’s as much a game of frequencies as it is tones. Are you a guitarist switching over to bass? Listen to the kick and snare, they are your twin gods. Given a thorough workout with P and J pickups and played with fingers and pick, the Terror Bass delivers the goods for retro-rock, 60s pop, indie, grunge, classic rock and a whole lot more besides. The clean switch allows you to tailor your headroom to taste, while cranking up the gain adds raunch and edge without turning to fizz or losing lows. The onboard EQ doesn’t have the widest bandwidth you’ll ever hear but the basic tones on offer are so effective in a band mix that we find only minor adjustments are required. Combined with Orange’s OBC112 rear-ported cabinet featuring a 400-watt 12-inch Lavoce Neodymium speaker, there’s plenty of punch and lows and more than enough power for the average function-band or club gig. Need more? Try running it in four-ohm mode with an extra cabinet, or bolstering your signal by running the excellent-sounding post-EQ and volume DI output straight into the PA. The Class D revolution has redrawn the landscape when it comes to compact bass rigs, and there’s certainly far more serious competition today in the lightweight, affordable bass amp stakes than when the first iteration of the Terror Bass arrived nearly a decade ago. 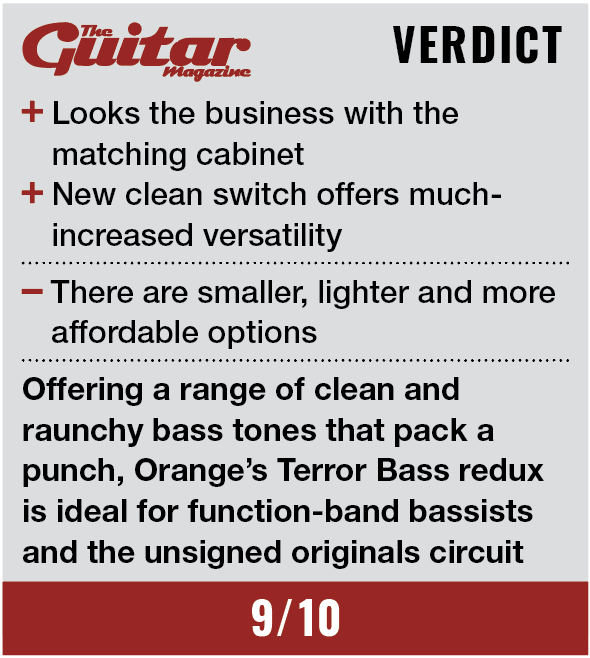 That said, thanks to that clean switch, the 2018 version is considerably more versatile than the original – and it still provides wonderfully organic tones that rockers and retro-inclined bassists alike will love, while breaking neither back nor bank.